Abel's Hill Cemetery gravestones: Col. John Allen Esq. 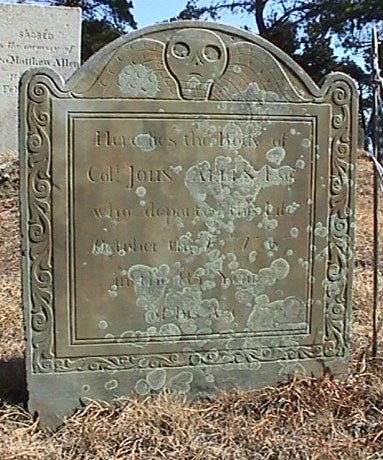 Colonel John Allen was a Chilmark gentleman. He was a wealthy man, a large land holder and a speculator, and was High Sheriff of the county from 1714 to 1733. He was the son of James Allen and Elizabeth Partridge, and the husband of Margaret Homes. For more information, see The Allen Family Project. Back to the Abel's Hill Cemetery menu.